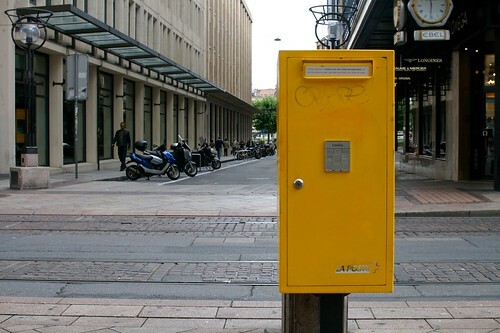 Another one about post-related issues: the swiss Post just launched a new service called Swiss Post Box: the "electronic equivalent to your regular physical mail box". It allows subscribers to receive scans of their unopened envelopes by e-mail message and then decide which ones they want opened and scanned in their entirety, to be read or achieved online (or "shredded"). You pay a monthly fee and you get a a set number of scans, at least one address for free and long-term archiving. There's even a connection with a Miles program for flights. An interface detail that struck me as curious too is the fact that the interface is only in english, which gives an interesting hint about the target groups of these services. Why do I blog this an interesting service at the crossroads of the digital and the physical. I am pretty sure there could be lots of possibilities in terms of applications based on this kind of platform, both in terms of personal information management and less utilitarian purposes. Besides, It's intriguing to think about the implications in terms of need to have letters/mail in material format and the importance of physical space. Concerning the importance of paper, I'm curious to see how people would be react and what sort of routine can be put in place to choose between what should be sent online and what should be kept (and when because there are obviously lots of exceptions). Now about space, as the NYT piece puts it "There’s a huge amount of infrastructure", the letters will no longer sit in a shoebox under your desk but they will be stockpiled in huge data-warehouse here and there, a sort of add-on to the post buildings. Eventually, it may also change the Post's general process which are based on flow and less on accumulating data. I don't mean here that Postal services never had to deal with keeping things but the scale may change with this sort of innovation.